It’s no secret that Orange County CyberKnife & Radiation Oncology Center (OCCROC) offers some of the most highly skilled and well-known cancer specialists in the country. They are often asked to speak at local, national and world conferences on the topic of radiation oncology and cancer treatment. 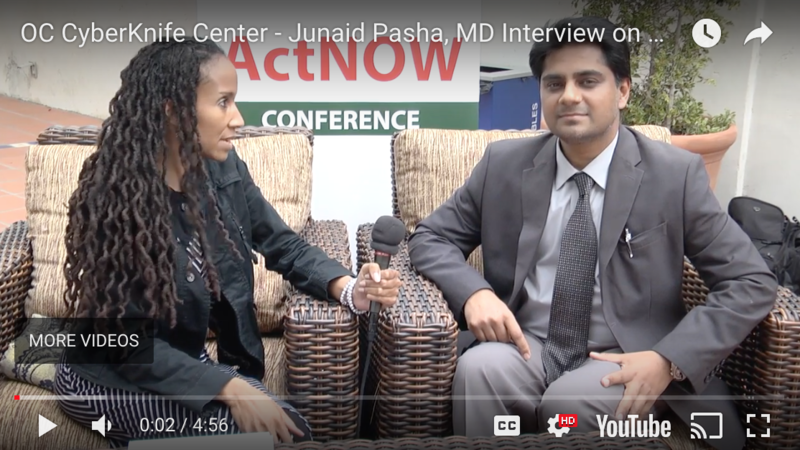 Recently OCCROC’s Junaid Pasha, M.D., spoke to a group attending the annual ActNOW conference in Orange County. The annual cancer care conference discusses all types of cancers that particularly are high in African American communities with the goal of increasing early detection through screening and awareness, and to improve medical and psychological outcomes. The event is sponsored by The G.R.E.E.N. Foundation (TGN). TGF has emerged as a community leader in breast and prostate health education and the early detection of cancer in especially in underserved communities for the past 14 years. After his presentation, Dr. Pasha answered questions from one of the ActNow staff members. Q: Could you just briefly tell us the common concerns of men who are first diagnosed with prostate cancer? A: Yes, a lot of anxiety. Because most of the people don’t have a lot of information about prostate cancer specifically, but they do have a lot of information about cancer. So one of the things is that when they come into my clinics, they’re like, “Am I going to die?” just because they have a diagnosis of cancer. And that is just not the case with prostate cancer specifically. Q: How do you explain the prognosis to your patients who have been diagnosed with prostate cancer? A: It’s a very, very indolent disease where it does not really translate into having a high mortality rate. It’s something that they learn during the process and as they learn more, they understand how common it is in a certain age group, and mostly an elderly population. And once they come to know of the available options for the management, then they are at ease, but that takes a lot of help. Not from a lot of paramedical staff, nursing staff, social services, at that time they are getting the education after their diagnosis. So, the main concern of that is mostly that it’s cancer, and they don’t know much about it except that cancer is bad. Q: What would a person going through radiation treatment typically experience? A: This is pretty much similar to the fact that they really don’t know what they are going to be getting. They don’t know what they are expecting. They do keep surgery in mind, and they know going into an operating room can cause a lot of complications during the surgery or after the surgery, and what their state would be after the surgical procedure. No, no, no. Radiation doesn’t do any of that. We sit down and try to explain to them that radiation is a process, which is very specific to the site we are treating. Especially from the fact that this does not involve cutting, bleeding, anesthesia, or a prolonged recovery people usually require from surgery. None of that is with radiation. Everybody has had X-rays at some point in their lives. It’s pretty much a similar way of going through the process. So once they get educated as to how simple and easy this is, they become very comfortable within the first week of their treatment, and no matter how long a duration of treatment it is with radiation, they have more knowledge than any of the physicians or medical staff because of the experience that they go through. Q: And are there cancers that respond quicker or better to radiation than others? A: Yes. There are certain types of cancers that are very sensitive to radiation. That when you give radiation on the first day, the response is usually seen. Unfortunately, prostate cancer in particular is not that type. But we do manage to take control of the disease in just a few weeks of treatment. There are different categories of cancer. Most of the cancers, within a week or two weeks of treatment, they start producing they effects and the decreased size of the tumor, the resolution of the tumor, and people are feeling a lot better already. If you have more questions about prostate cancer or any type of cancer that you or a loved one may have been diagnosed with, call Dr. Pasha or the other cancer experts at OCCROC at (714) 962-7100. Our radiation oncologists are board certified specialists and they are ready to answer all of your questions and explain the variety of treatment options that might be most effective for your type and stage of cancer. Call now.